Gulfstream Park has two carryovers on today’s eight race card, with first post of 12:55 p.m. In the first race there is a carryover of $6,301.22 on the Super Hi-5. The carryover on the Rainbow 6 has grown to $434,747.25. It is on today’s third through eighth races. Tampa Bay Downs has a ten-race card with first post of 12:43 p.m. There are no carryovers. Four races are scheduled for turf, which is always popular with fans of Tampa Bay. The Weather Channel forecast is for a 20 percent chance of rain in the Oldsmar area. Five Gulfstream races are scheduled for turf. According to the Weather Channel, there is a zero percent chance of rain in the Hallandale Beach area. Conditions are listed as fast and firm. In Sunday’s ninth and final race, there were no Super Hi-5 tickets with the first five finishers in correct order. The bet, a $1 minimum, has no consolation payouts and thus the entire pool rolled over to today’s first race. If there are no winning tickets, the entire pool rolls over to the next race that has seven or more starters. Based on past betting patterns at Gulfstream, it is likely that at least $50,000 will be bet on the Super Hi-5 in the first race. The first race is six furlongs on dirt for 3-year-old fillies. It is a $16,000 claimer with a $21,000 purse. Scoff, taking a steep drop and trained by Michelle Nevin, is the likely favorite in the eight-horse field. Emisael Jaramillo has the mount. Scoff has three wins, two second place finishes and two thirds in nine career starts. Her only off-the-board finishes were seventh and ninth in her two latest starts. Both were $50,000 optional claimers at six furlongs on dirt at Gulfstream, and she had rough trips in them. Scoff has early speed and should be able to have a clear run from the eight post. Scotland Bay, in her first start for trainer Jorge Navarro, and Bagema likely will fit somewhere in a race where it is hard to find any obvious tosses from the Super Hi-5. The Rainbow 6 carryover has been growing because Gulfstream has gone 11 straight days without the jackpot paying requirement of there being just one ticket with the winners of all Rainbow 6 races. 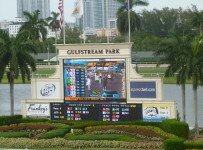 Gulfstream takes out 20 percent of each day’s Rainbow 6 bets. On days when there are multiple winning tickets, it divides 56 percent among holders of those tickets and puts 24 percent into the carryover. The Rainbow 6 is a 20-cent only per combination bet, with multiple horses allowed in each race. For example, a ticket with two horses in each race has 64 combinations and costs $12.80.